However, the level of immune compromise is the most important determinant in assessing the likelihood of various pulmonary complications. This is reflected in the CD4 count, with specific diseases occurring with increasing frequency as certain CD4 thresholds are reached. At CD4 levels above 400, patients are at risk of infection from relatively virulent organisms, such as bacteria and TB. Lung cancer may also occur at this stage. Between counts of 200 and 400, patients may suffer from recurrent infection as well as lymphoma. Opportunistic infections and KS are rare at CD4 levels >200 and indeed most cases of PCP occur at CD4 counts below 100, along with Mycobacterium avium complex (MAC), fungal infections and CMV  [Table 2]. High-resolution computed tomography (HRCT) is both more sensitive and more accurate, with an overall diagnostic accuracy of 92%, including 90% for KS and 94% for PCP. Furthermore, CT has a useful 93% negative predictive value in excluding active pulmonary disease. When comparing CXR and HRCT, Kang found that a confident diagnosis was made more often on CT than on CXR, and this confident diagnosis was more often correct on CT than on CXR. The correct confident interpretation was made more often in patients with lymphoma (100%), KS (91%) and PCP (87%). However, CT only affords a modest improvement and is therefore not routinely indicated [29 ] [Table 3]. Specific indications include the detection of occult disease in symptomatic patients, characterizing nonspecific radiographic disease patterns, assessment of the mediastinum, staging malignancy, assessing complications (particularly pleural disease) and guiding invasive procedures. Infections are the most common pulmonary complication of AIDS, and bacteria are the most common cause of infection, superseding PCP at all levels of immune compromise. P. carinii remains the most common opportunistic and most common life-threatening pulmonary infection in AIDS. ,, PCP usually occurs in patients not receiving medical care. , Radiographic changes are varied and may lag behind the symptoms. The classic appearance is of bilateral symmetric perihilar or diffuse interstitial opacification, which may be reticular, finely granular or ground-glass in appearance  [Figure 5],[Figure 6],[Figure 7]. If left untreated, this may progress to alveolar consolidation in 3 or 4 days. Infiltrates clear within 2 weeks but in a proportion, infection will be followed by coarse reticular opacification and fibrosis  [Figure 8] and [Figure 9]. HRCT is more sensitive, the hallmark being ground-glass attenuation, seen in over 90% of the cases. It often has a geographic or mosaic distribution. In this clinical setting, this is virtually diagnostic of PCP and is sufficient for commencement of empirical treatment  [Figure 10] and [Figure 11]. 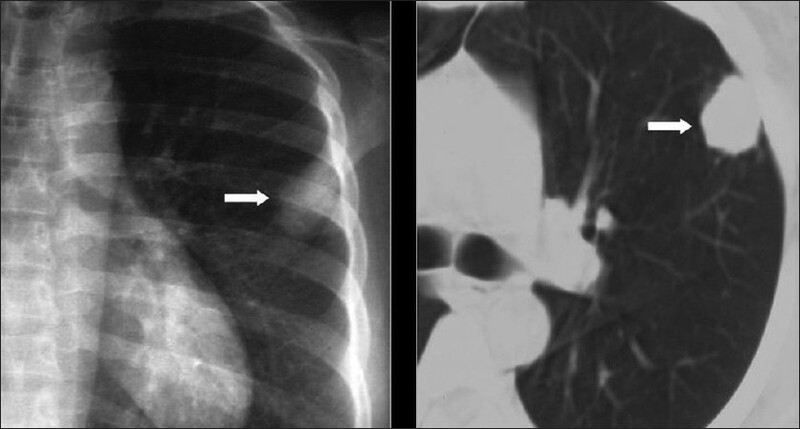 Foci of consolidation and interlobular septal thickening may be seen in the subacute stage due to organized inflammatory infiltrate  [Figure 10] and [Figure 11]. Cystic lung disease is a relatively common manifestation. , Cysts are usually multiple and bilateral, but range in size, shape and distribution , [Figure 12]. They may develop in the acute or postinfective period and have been reported to remain for up to 3 years. They are more commonly appreciated on CT/HRCT, being reported in up to one-third of the patients [Figure 13]. 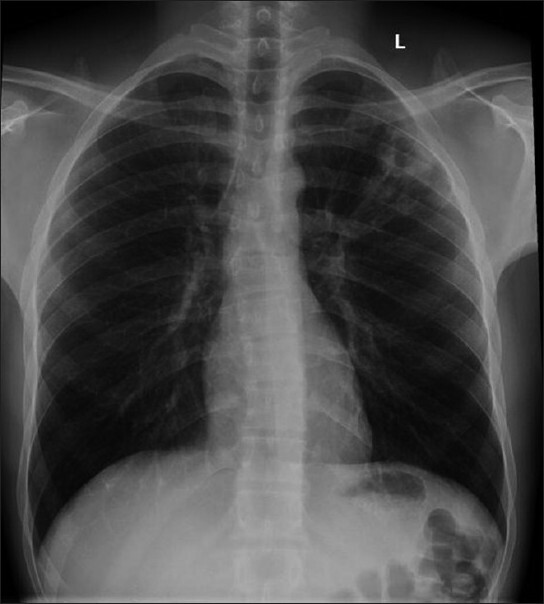 Spontaneous pneumothorax is a well-recognised complication, particularly in patients with cysts [Figure 14]. 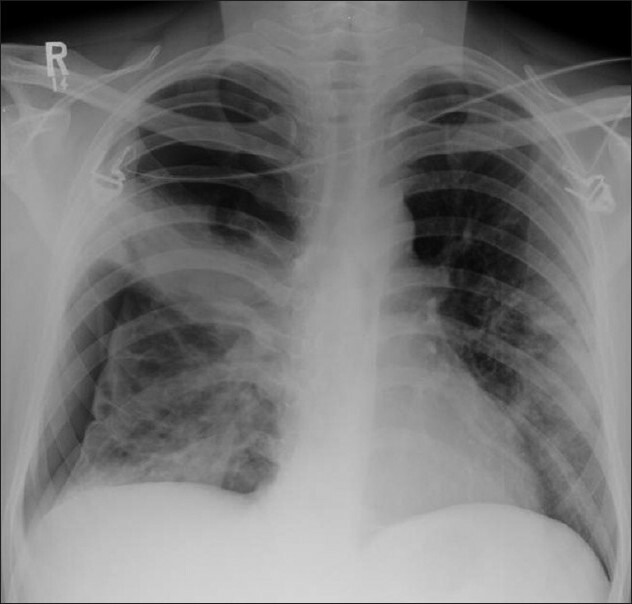 Pneumothoraces may be bilateral and they have important implications for management and prognosis as patients have a significantly increased mortality rate [Figure 15] and [Figure 16]. 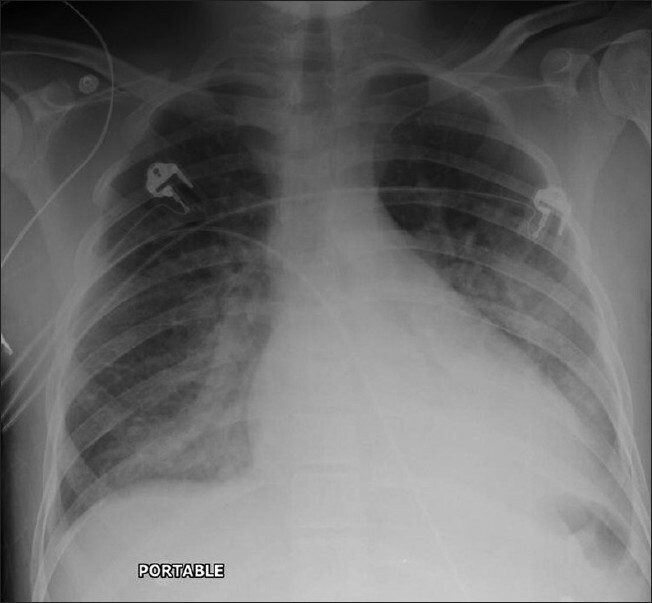 Pneumothoraces are often refractory to conventional chest tube drainage, becoming chronic and requiring pleurodesis or surgical intervention  [Figure 17]. 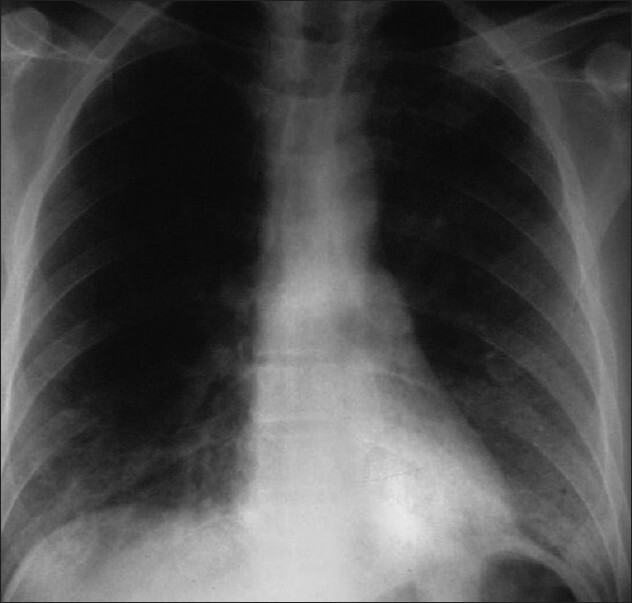 The CXR may be normal in 10%, although this is uncommon in clinical practice , Atypical findings are seen in a further 10%, including isolated focal or asymmetrical dense consolidation, airways disease and adenopathy. Effusions are extremely uncommon and should prompt the search for other pathogens. Nodules are another unusual manifestation. Histologically, these represent granulomas. Nodules can vary from miliary to >1 cm in size, and may infrequently undergo cavitation or calcification , [Figure 18],[Figure 19],[Figure 20],[Figure 21],[Figure 22]. Features of reactivation MTB are patchy consolidation, including involvement at unusual sites, e.g. lower lobes, cavitation, nodularity, effusions and adenopathy [Figure 23]. 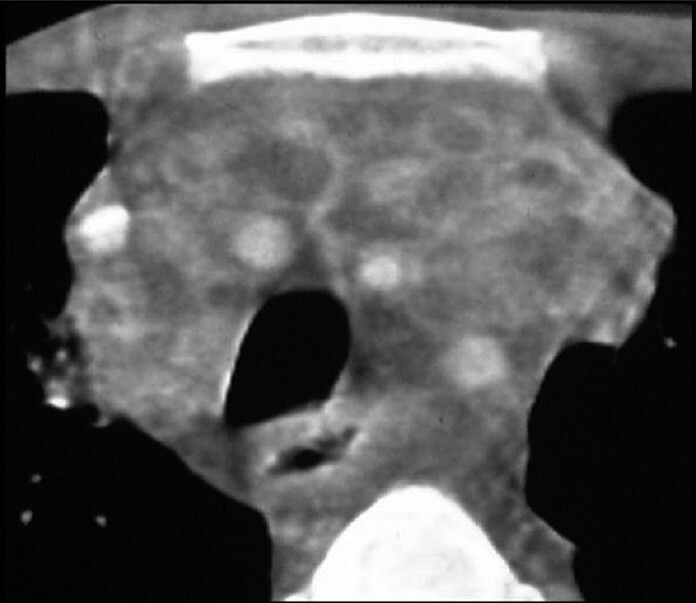 TB lymph nodes are typically markedly enlarged and of low attenuation on CT, often demonstrating rim enhancement following contrast administration ,, [Figure 24]. 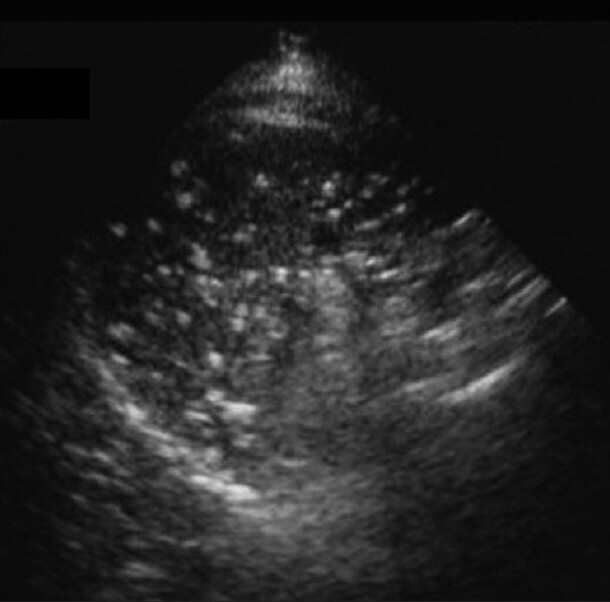 "Primary" MTB manifests as focal unilateral, often lower lobe consolidation and adenopathy  [Figure 25]. Cavitation is less common at lower CD4 counts. Patients in this range also have an increased incidence of miliary MTB, with diffuse, randomly distributed nodules on CT [Figure 26]. Approximately 15% of the patients have normal CXRs. This particularly occurs when disease is isolated to the airways. 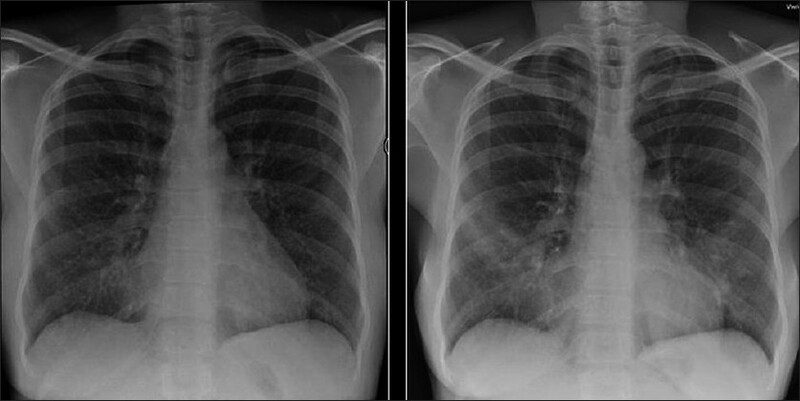 Alternatively, the CXR may demonstrate an asymmetric reticulonodular pattern. 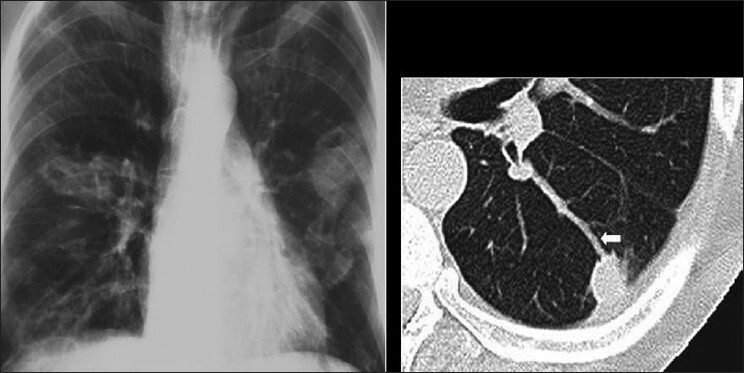 However, the HRCT is invariably abnormal, typically demonstrating adenopathy and the "tree-in-bud" pattern, similar to bacterial bronchiolitis  [Figure 27]. However, this is usually asymmetric and involves upper as well as lower lobes in distinction to bacterial infection. Cryptococcus is the fourth most common opportunistic infection in AIDS. , The lungs are the portal of entry and the most common site of infection although, the common clinical presentation is with meningitis, pneumonia occurring in only approximately 30%. , Imaging findings are varied and nonspecific. Reticular or reticulonodular infiltrates are the most common pattern , [Figure 31]. Solitary or multiple nodules [Figure 32], often up to 4 cm in diameter, are seen in around 30%. Biopsy is usually required for diagnosis. Cavitation occurs less frequently in AIDS-related disease compared to immune competent hosts, usually appearing early in the course of the illness, when the level of immune suppression is mild ,, [Figure 33] and [Figure 34]. 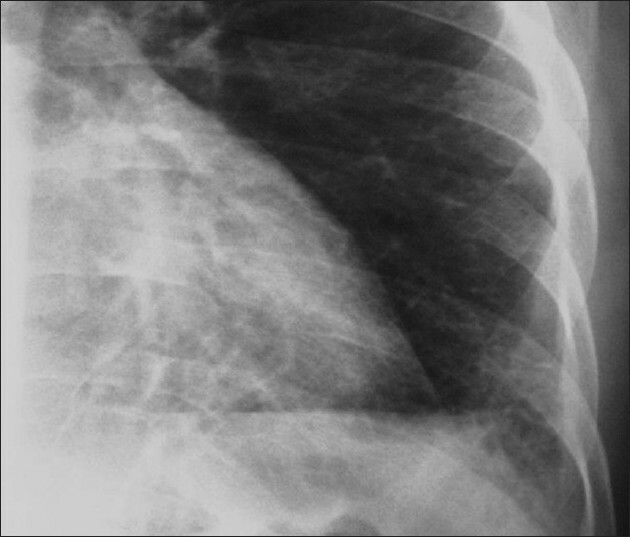 Less-frequent manifestations include adenopathy, effusions, consolidation, miliary nodularity and ground-glass opacification and chest wall abscesses , [Figure 35]. Aspergillosis occurs almost exclusively in association with neutropoenia, usually secondary to drug therapy. , The incidence is reported to be around 1%, but is thought to be increasing due to prolonged survival at advanced levels of immune suppression. All forms have been described, often coexisting in the same patient. Mycetomas are the least common, but can complicate cavitary MTB or PCP , [Figure 36]. Clinical progression to invasive Aspergillosis is reported to occur in 50%, despite antifungal therapy, whereas this is not a feature of the disease in immune competent hosts. 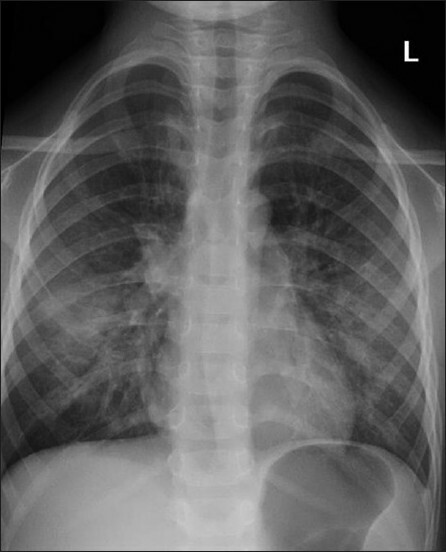 Angioinvasive disease is most common, manifest as thick-walled cavitary lesions predominating in the upper lobes, with air-crescents surrounding areas of desquamated infarcted lung , [Figure 37] Less-common patterns include nodules with a peripheral halo of ground-glass attenuation and isolated airway disease [Figure 38] or Allergic bronchopulmonary Aspergillosis (ABPA), manifesting as bilateral lower lobe consolidation, bronchiectasis and airway impaction or "finger in glove" , [Figure 39] and [Figure 40]. The spectrum of radiographic findings is varied and overlaps other AIDS-related diseases, most notably PCP. Features include ground-glass opacification, nodules (varying from miliary to 3 cm), perihilar and lower zone interstitial infiltrates and effusions. When ground-glass opacification is associated with nodularity and an effusion, CMV should be considered over PCP, especially in patients with CD4 counts below 50. Small airway disease may be the sole manifestation of infection  [Figure 41] and [Figure 42]. 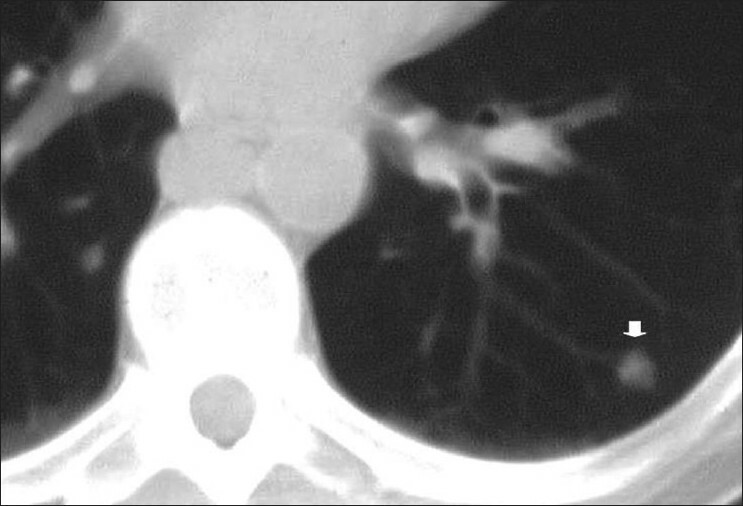 Thickening of bronchovascular bundles reflecting the bronchocentric distribution of disease is demonstrated on HRCT. Interlobular septal thickening due to lymphatic obstruction and tumor invasion is also seen ,, [Figure 44]. 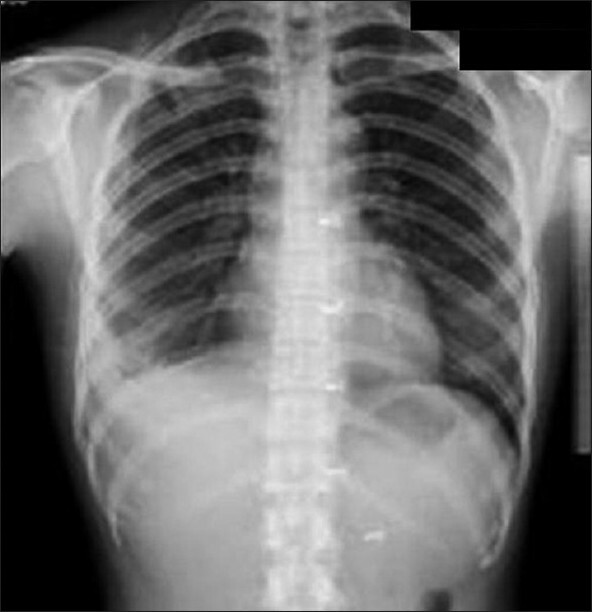 Pleural effusions are common, present in around 30%. They may be unilateral or bilateral and may be large and characteristically hemorrhagic on aspiration ,, [Figure 45]. Well-defined solitary or multiple parenchymal nodules are common [Figure 46]. These are frequently large and often demonstrate a very short doubling time of between 4 and 6 weeks, mimicking infection. 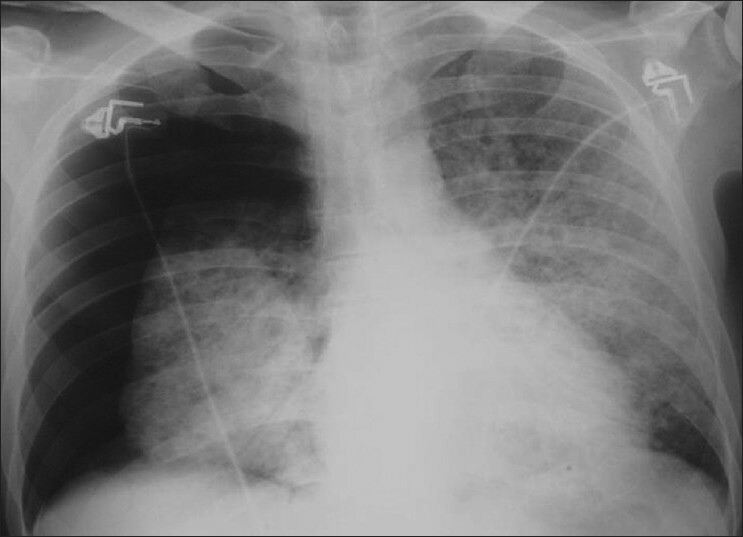 Unlike KS, they are often peripheral and while air-bronchograms may be seen, cavitation is unusual , [Figure 47]. There is conflicting data regarding the incidence of lung carcinoma in AIDS and, to date, there is no convincing evidence showing a significant rise. ,, It occurs in smokers, although important clinical differences have been noted compared with the general population. There is a striking male preponderance and patients often present at a younger age and at a later stage. , There is no correlation between stage of disease and CD4 count. Tumors are frequently poorly differentiated or predominantly adenocarcinomas. , Radiographic appearances are similar to ordinary lung cancer, except that lesions tend to be more peripheral, with over 90% in the upper lobes. 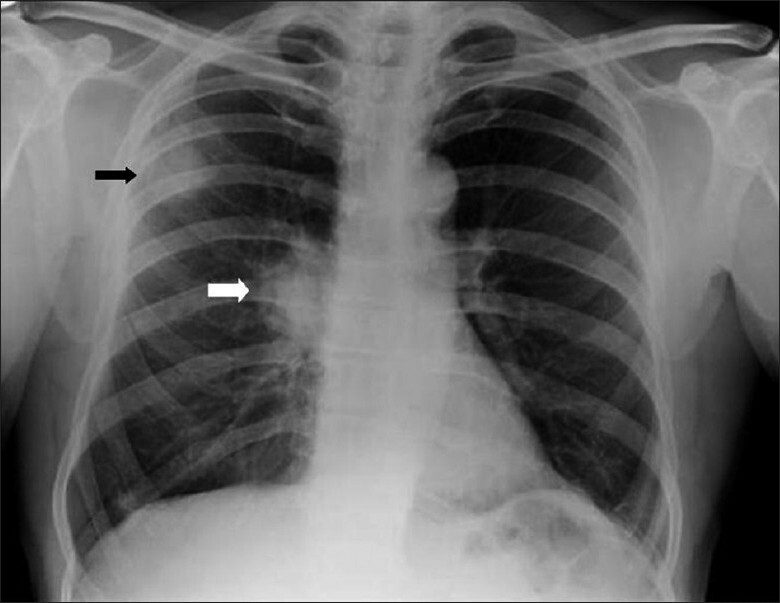 , Extensive pleural disease as the sole radiographic manifestation of lung cancer has also been reported , [Figure 48]. A spectrum of polyclonal lymphoproliferative disorders affects the lungs of HIV-positive patients, the most common being lymphocytic interstitial pneumonitis. , This is thought to represent lymphoid hyperplasia in response to chronic antigenic stimulation by the AIDS virus. , It is far more common in children than in adults. The diagnosis is made on transbronchial biopsy. On CT, there is smooth and nodular thickening of bronchovascular bundles, centrilobular and subpleural nodularity, ground-glass opacification and interlobular septal thickening. 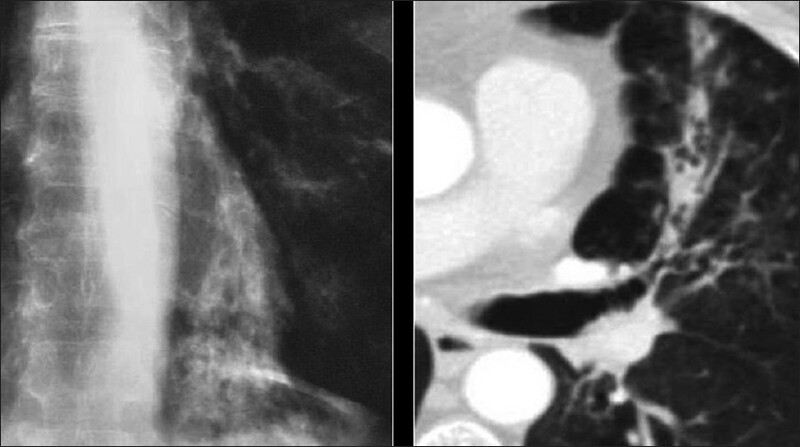 ,, Cysts and mediastinal adenopathy may also be seen  [Figure 49] and [Figure 50]. Bronchiolitis obliterans, with or without organizing pneumonia in the absence of infection, can be a feature of AIDS. ,,, This is an infrequent imaging diagnosis, although focal air trapping on expiratory CT, consistent with bronchiolitis obliterans, has been demonstrated in two-thirds of HIV-positive patients without AIDS, the severity increasing with the duration of infection. However, because definitive diagnosis requires lung biopsy, the true incidence of disease is unknown and, in clinical practice, the diagnosis is usually one of exclusion. The radiographic appearance is as for non-AIDS  [Figure 51]. Recently, work suggests that there may be a higher incidence of pulmonary emphysema among HIV-positive smokers. The probable cause may lie in the susceptibility of HIV patients to recurrent chest infections  [Figure 52]. Better prophylaxis for opportunistic infections and the development of HAART has had a significant impact against HIV on viral load, CD4 + cell count and HIV-related mortality in HIV patients. With longer survival, cardiovascular complications are becoming manifest in these patients. Cardiovascular complications of HIV include cardiomyopathy and pulmonary arterial hypertension [Figure 53]. A higher incidence of atherosclerosis has been reported possibly secondary to protease inhibitor therapies. A recent study lists HIV as a risk factor for deep venous thrombosis and pulmonary embolism  [Figure 54]. Finally, a couple of cases do not fit into the categories already described, including mediastinal vascular complications [Figure 55]. Lastly, it would be difficult to predict the biopsy-proven diagnosis in patients with ill-defined centrilobular nodules and confluent mass-like areas of consolidation without knowing that they were hemophiliac and had AIDS [Figure 56]. 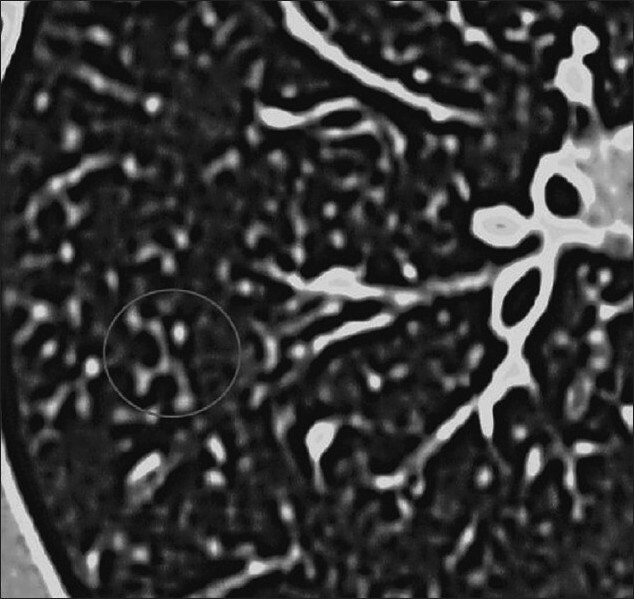 Limitations reflecting overlapping appearances, atypical manifestations and coexisting disease contribute to a relative lack of specificity of imaging. However, certain basic radiographic patterns can be recognized, which should raise the suspicion of certain underlying disease processes. Despite the development of effective antiviral therapies and better prophylaxis of opportunistic infections, pulmonary complications of HIV/AIDS remain an important cause of morbidity and mortality. 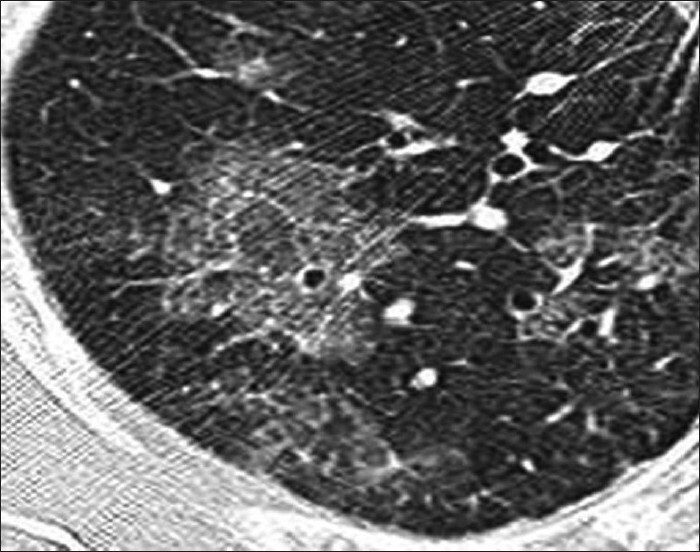 We have provided a pictorial assay of the lung afflictions seen in HIV/AIDS and have discussed the interpretation of imaging studies based on pattern recognition read in conjunction with demographic, clinical and laboratory data. 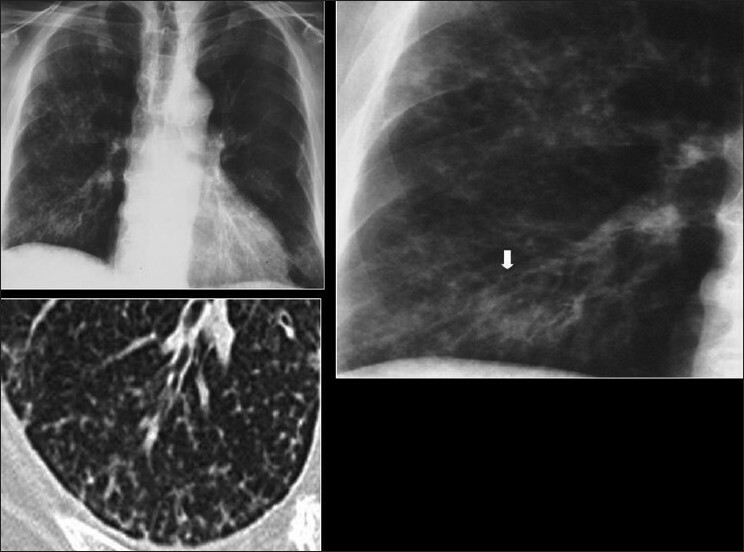 Presently, a CXR remains the mainstay of thoracic imaging in HIV-infected patients, but CT/HRCT plays an increasingly important complementary role in establishing an accurate diagnosis when CXR findings are equivocal or nonspecific. 1. The latest statistics on the world epidemic of HIV and AIDS were published by UNAIDS/WHO in July 2008, and refer to the end of 2007. 2. Beck JM, Rosen MJ, Peavy HH. Pulmonary complications of HIV infection: Report of the Fourth NHLBI Workshop. Am J Respir Crit Care Med 2001;164:2120-6. 3. Taylor IK, Coker RJ, Clarke J, Moss FM, Nieman R, Evans DJ,et al. Pulmonary complications of HIV disease: 10-year retrospective evaluation of yields from bronchoalveolar lavage, 1983-93. Thorax 1995;50:1240-5. 4. Rosen MJ. Overview of pulmonary complications. Clin Chest Med 1996;17:621-31. 5. Poirier CD, Inhaber N, Lalonde RG, Ernst P. Prevalence of bronchial hyperrsponsiveness among HIV-infected men. Am J Respir Crit Care Med 2001;164:542-5. 6. Fleischman JK, Greenberg H, Web A. Small airways dysfunction in patients with AIDS and Pneumocystis carinii pneumonia. AIDS Patient Care STDS 1996;10:16-20. 7. Palella FJ Jr, Delaney KM, Moorman AC, Loveless MO, Fuhrer J, Satten GA, et al. Declining morbidity and mortality among patients with advanced human immunodeficiency virus infection. HIV Outpatient Study. N Engl J Med 1998;338:853-60. 8. Gortmaker SL, Hughes M, Cervia J, Brady M, Johnson GM, Seage GR 3rd, et al. Effect of combination therapy including protease inhibitors on mortality among children and adolescents infected with HIV-1. N Engl J Med 2001;345:1522-8. 9. Sullivan JH, Moore RD, Keruly JC, Chaisson RE. Effect of antiretroviral therapy on the incidence of bacterial pneumonia in patients with advanced HIV infection. Am J Respir Crit Care Med 2000;162:64-7. 10. Public Health Service, Depart of Health and Human Services, CDCHIV/AIDS Surveillance Report 2002;13:1-41, Joint United Nations Programme on HIV/AIDS/World Health Organization. 11. AIDS Epidemic Update. Joint publication of WHO and UNAIDS ISBN 92 9173 132 3. Dec 2001. 12. Haramati LB, Jenny-Avital ER. Approach to the diagnosis of pulmonary disease in patients infected with the human immunodeficiency virus. J Thorac Imaging 1998;13:247-60. 13. Katariya K, Thurer RJ. Thoracic malignancies associated with AIDS. Semin Thorac Cardiovasc Surg 2000;12:148-53. 14. Holemans JA, Howlett DC, Ayers AB. Imaging the thoracic manifestations of AIDS. Hosp Med 1998;59:352-8. 15. Lamb RJ, Yeh IT. Tuberculosis, AIDS, and i.v. drug abuse. N J Med 1990;87:413-5. 16. Healy E, Kelly P, Mulcahy FM, Clancy L. AIDS, i.v. drug use and mycobacterial disease: The Dublin experience. Respir Med 1992;86:491-4. 17. Wollschlager CM, Khan FA, Chitkara RK, Shivaram U. Pulmonary manifestations of the acquired immunodeficiency syndrome (AIDS). Chest 1984;85:197-202. 18. Suster B, Akerman M, Orenstein M, Wax MR. Pulmonary manifestations of AIDS: Review of 106 episodes. Radiology 1986;161:87-93. 19. Sider L, Weiss AJ, Smith MD, VonRoenn JH, Glassroth J. 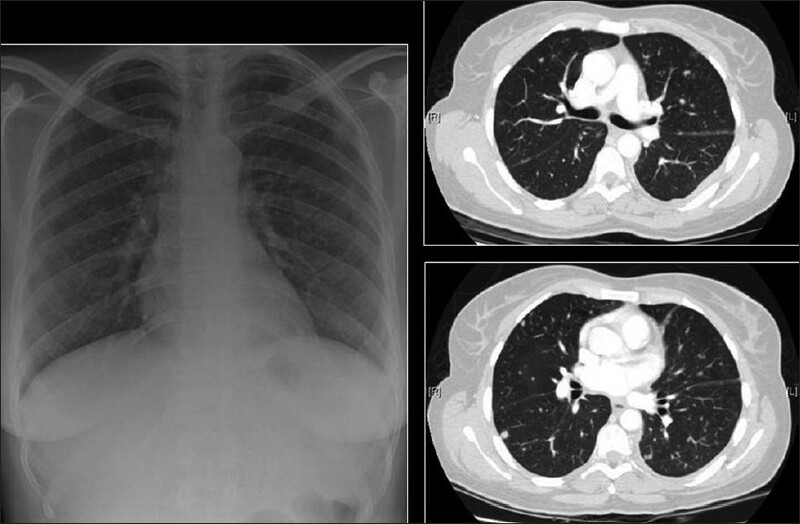 Varied appearance of AIDS-related lymphoma in the chest. Radiology 1989;171:629-32. 20. McLoud TC, Naidich DP. Thoracic disease in the immunocompromised patient. Radiol Clin North Am 1992;30:525-54. 21. McAdams HP, Rosado-de-Christenson ML, Lesar M, Templeton PA, Moran CA. 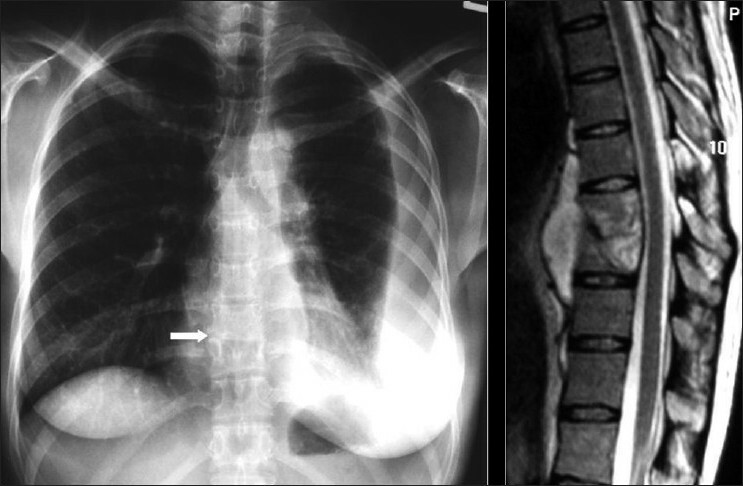 Thoracic mycoses from endemic fungi: Radiologic-pathologic correlation. Radiographics 1995;15:255-70. 22. Khalil AM, Carette MF, Cadranel JL, Mayaud CM, Bigot JM. 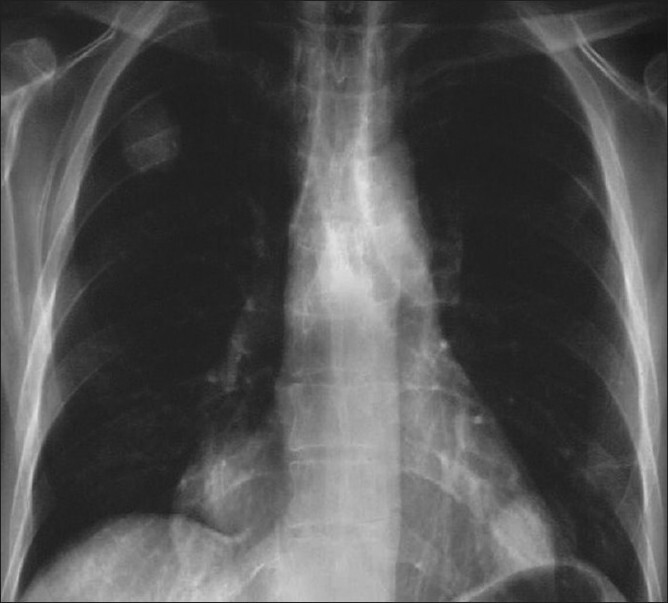 Intrathoracic Kaposi's sarcoma. CT findings. Chest 1995;108:1622-6. 23. Edinburgh KJ, Jasmer RM, Huang L, Reddy GP, Chung MH, Thompson A, et al. 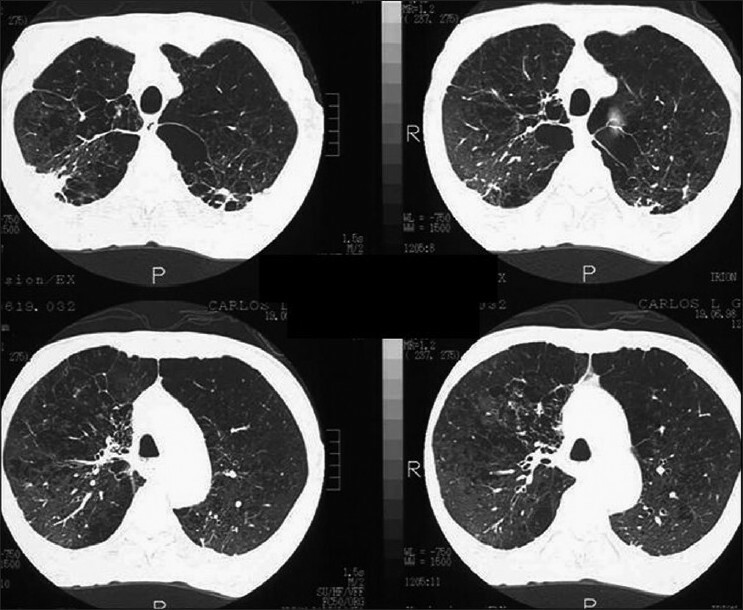 Multiple pulmonary nodules in AIDS: Usefulness of CT in distinguishing among potential causes. Radiology 2000;214:427-32. 24. Tavel JA, Sereti I, Walker RE, Hahn B, Kovacs JA, Jagannatha S, et al. A randomized, double-blinded, placebo-controlled trial of intermittent administration of interleukin-2 and prednisone in subjects infected with human immunodeficiency virus. J Infect Dis 2003;188:531-6. 25. Helweg-Larsen J, Benfield TL, Eugen-Olsen J, Lundgren JD, Lundgren B. Effects of mutations in Pneumocystis carinii dihydropteroate synthase gene on outcome of AIDS-associated P. carinii pneumonia. Lancet 1999;354:1347-51. 26. Hanson DL, Chu SY, Farizo KM, Ward JW. Distribution of CD4+ T lymphocytes at diagnosis of acquired immunodeficiency syndrome-defining and other human immunodeficiency virus-related illnesses. The Adult and Adolescent Spectrum of HIV Disease Project Group. Arch Intern Med 1995;155:1537-42. 27. Boiselle PM, Tocino I, Hooley RJ, Pumerantz AS, Selwyn PA, Neklesa VP, et al. 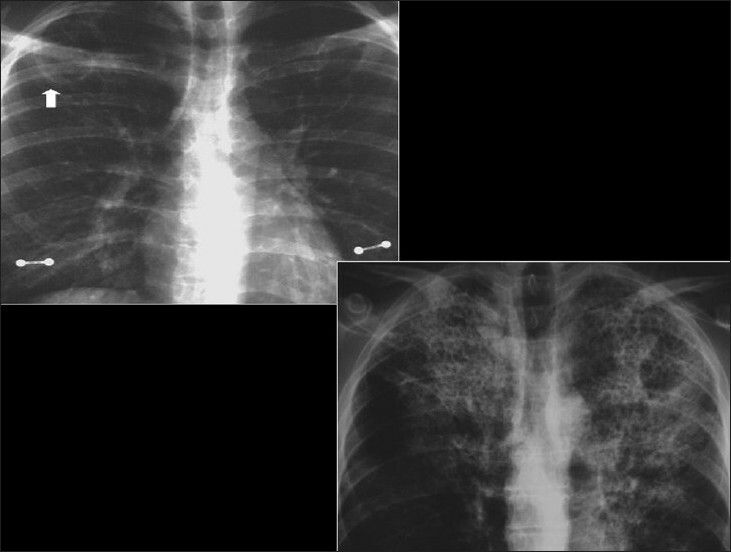 Chest radiograph interpretation of Pneumocystis carinii pneumonia, bacterial pneumonia and pulmonary tuberculosis in HIV-positive patients: Accuracy, distinguishing features, and mimics. J Thorac Imaging 1997;12:47-53. 28. Hartman TE, Primack SL, Mόller NL, Staples CA. Diagnosis of thoracic complications in AIDS: Accuracy of CT. AJR Am J Roentgenol 1994;162:547-53. 29. Kang EY, Staples CA, McGuinness G, Primack SL, Mόller NL. Detection and differential diagnosis of pulmonary infections and tumors in patients with AIDS: Value of chest radiography versus CT. AJR Am J Roentgenol 1996;166:15-9. 30. Hirschtick RE, Glassroth J, Jordan MC, Wilcosky TC, Wallace JM, Kvale PA, et al. Bacterial pneumonia in persons infected with the human immunodeficiency virus. Pulmonary Complications of HIV Infection Study Group. N Engl J Med 1995;333:845-51. 31. Schneider RF. Bacterial pneumonia. Semin Respir Infect 1999;14:327-32. 32. Afessa B, Green B. Bacterial pneumonia in hospitalized patients with HIV infection: The Pulmonary Complications, ICU Support, and Prognostic Factors of Hospitalized Patients with HIV (PIP) Study. Chest 2000;117:1017-22. 33. Selwyn PA, Pumerantz AS, Durante A, Alcabes PG, Gourevitch MN, Boiselle PM, et al. Clinical predictors of Pneumocystis carinii pneumonia, bacterial pneumonia and tuberculosis in HIV-infected patients. AIDS 1998;12:885-93. 34. Fraser RS, Mόller NL, Colman N, Parι PD. General features of pulmonary infection. 4th ed. Diagnosis of Diseases of the Chest. In: Fraser's, Parι's, editors. Philadelphia, PA: W.B. Saunders; 1999. p. 701. 35. McGuinness G. Changing trends in the pulmonary manifestations of AIDS. Radiol Clin North Am 1997;35:1029-82. 36. Maki DD. Pulmonary infections in HIV/AIDS. Semin Roentgenol 2000;35:124-39. 37. Hoover DR, Saah AJ, Bacellar H, Phair J, Detels R, Anderson R, et al. 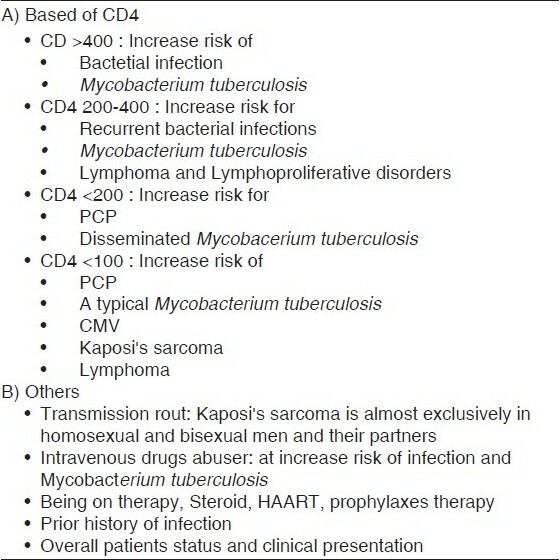 Clinical manifestations of AIDS in the era of Pneumocystis prophylaxis. Multicenter AIDS Cohort Study. N Engl J Med 1993;329:1922-6. 38. Rimland D, Navin TR, Lennox JL, Jernigan JA, Kaplan J, Erdman D, et al. Prospective study of etiologic agents of community-acquired pneumonia in patients with HIV infection. AIDS 2002;16:85-95. 39. Wolff AJ, O'Donnell AE. Pulmonary manifestations of HIV infection in the era of highly active antiretroviral therapy. Chest 2001;120:1888-93. 40. Boiselle PM, Crans CA Jr, Kaplan MA. The changing face of Pneumocystis carinii pneumonia in AIDS patients. AJR Am J Roentgenol 1999;172:1301-9. 41. Kaplan JE, Hanson D, Dworkin MS, Frederick T, Bertolli J, Lindegren ML, et al. Epidemiology of human immunodeficiency virus-associated opportunistic infections in the United States in the era of highly active antiretroviral therapy. Clin Infect Dis 2000;30:S5-14. 42. Gruden JF, Huang L, Turner J, Webb WR, Merrifield C, Stansell JD, et al. 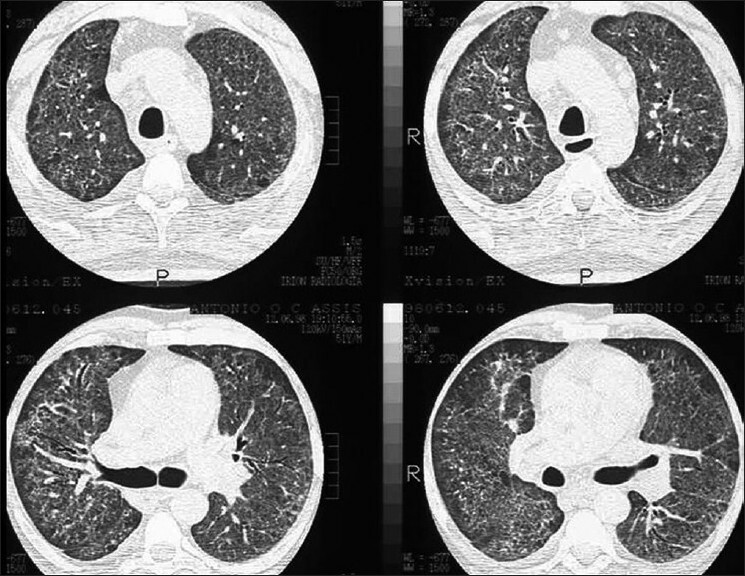 High-resolution CT in the evaluation of clinically suspected Pneumocystis carinii pneumonia in AIDS patients with normal, equivocal, or nonspecific radiographic findings. AJR Am J Roentgenol 1997;169:967-75. 43. Havlir DV, Barnes PF. Tuberculosis in patients with human immunodeficiency virus infection. N Engl J Med 1999;340:367-73. 44. Leung AN. Pulmonary tuberculosis: The essentials. Radiology 1999;210:307-22. 45. Saurborn DP, Fishman JE, Boiselle PM. The imaging spectrum of pulmonary tuberculosis in AIDS. J Thorac Imaging 2002;17:28-33. 46. Long R, Maycher B, Scalcini M, Manfreda J. The chest roentgenogram in pulmonary tuberculosis patients seropositive for human immunodeficiency virus type 1. Chest 1991;99:123-7. 47. 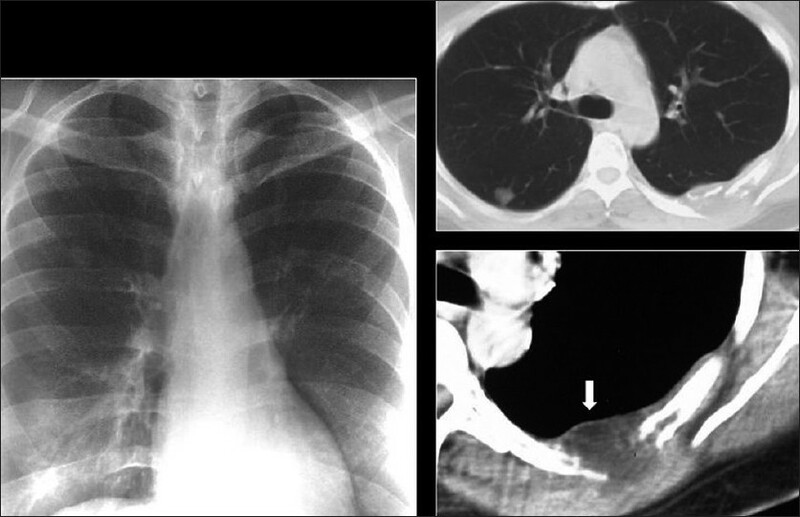 Fishman JE, Saraf-Lavi E, Narita M, Hollender ES, Ramsinghani R, Ashkin D. Pulmonary tuberculosis in AIDS patients: Transient chest radiographic worsening after initiation of antiretroviral therapy. AJR Am J Roentgenol 2000;174:43-9. 48. Rizzi EB, Schinina V, Bellussi A, De Santis A, Mazzuoli G, Giosuι S, et al. Pulmonary mycosis in AIDS. Eur J Radiol 2001;37:42-6. 49. Wallace JM, Lim R, Browdy BL, Hopewell PC, Glassroth J, Rosen MJ, et al. Risk factors and outcomes associated with identification of Aspergillus in respiratory specimens from persons with HIV disease. Pulmonary Complications of HIV Infection Study Group. Chest 1998;114:131-7. 50. Staples CA, Kang EY, Wright JL, Phillips P, Mόller NL. 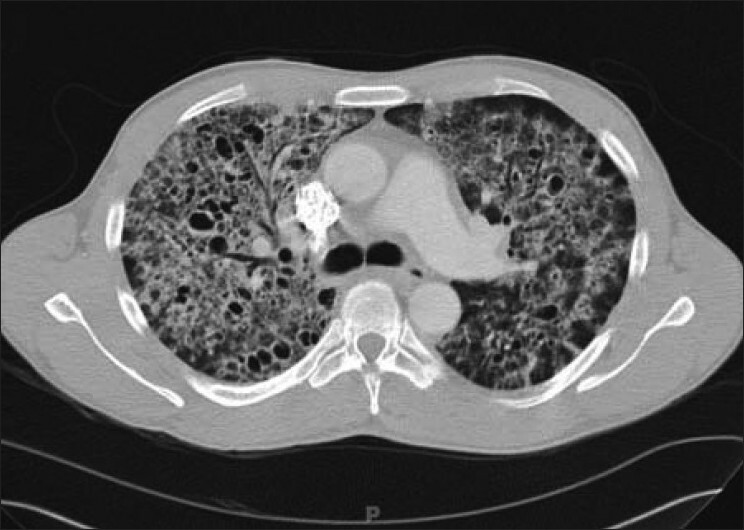 Invasive pulmonary aspergillosis in AIDS: Radiographic, CT, and pathologic findings. Radiology 1995;196:409-14. 51. Waxman AB, Goldie SJ, Brett-Smith H, Matthay RA. Cytomegalovirus as a primary pulmonary pathogen in AIDS. Chest 1997;111:128-34. 52. Cadranel J, Naccache J, Wislez M, Mayaud C. Pulmonary malignancies in the immunocompromised patient. Respiration 1999;66:289-309. 53. Ognibene FP, Steis RG, Macher AM, Liotta L, Gelmann E, Pass HI, et al. 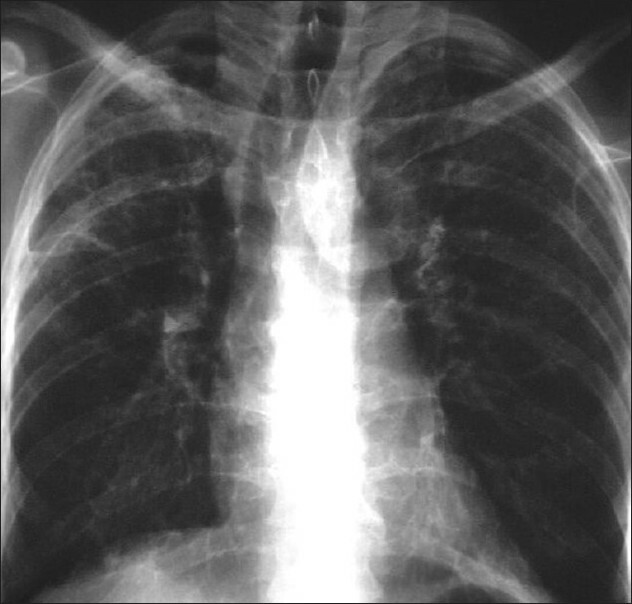 Kaposi's sarcoma causing pulmonary infiltrates and respiratory failure in the acquired immunodeficiency syndrome. Ann Intern Med 1985;102:471-5. 54. Wolff SD, Kuhlman JE, Fishman EK. 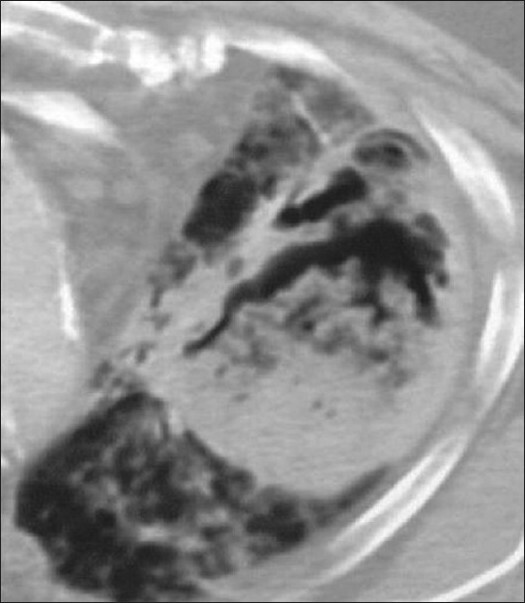 Thoracic Kaposi sarcoma in AIDS: CT findings. J Comput Assist Tomogr 1993;17:60-2. 55. Bazot M, Cadranel J, Benayoun S, Tassart M, Bigot JM, Carette MF. 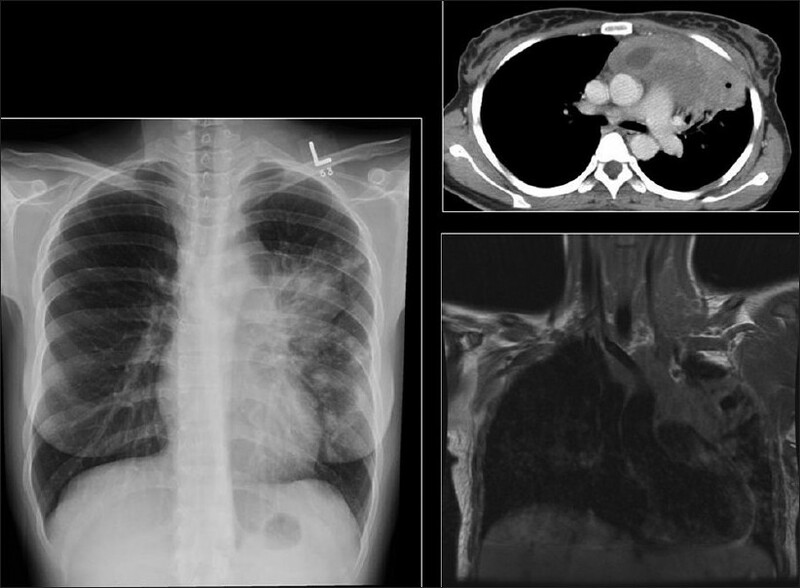 Primary pulmonary AIDS-related lymphoma: Radiographic and CT findings. Chest 1999;116:1282-6. 56. Goedert JJ, Cotι TR, Virgo P, Scoppa SM, Kingma DW, Gail MH, et al. Spectrum of AIDS-associated malignant disorders. Lancet 1998;351:1833-9. 57. Eisner MD, Kaplan LD, Herndier B, Stulbarg MS. 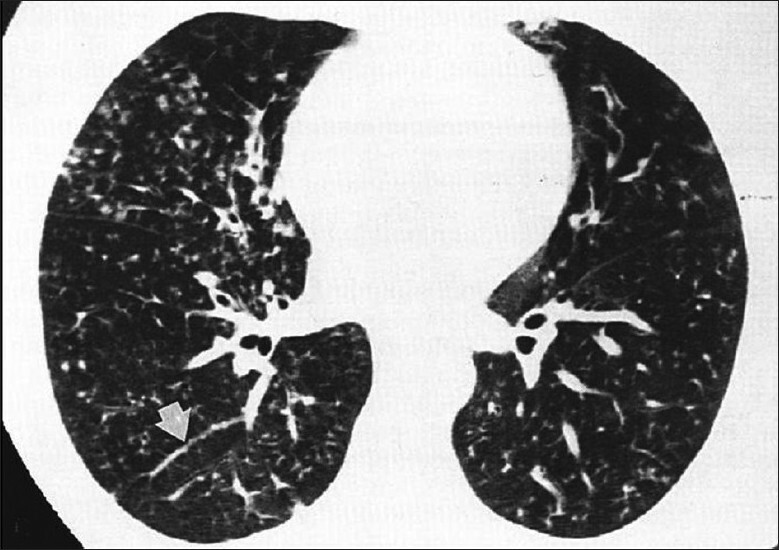 The pulmonary manifestations of AIDS- related non-Hodgkin's lymphoma. Chest 1996;110:729-36. 58. Carignan S, Staples CA, Mόller NL. 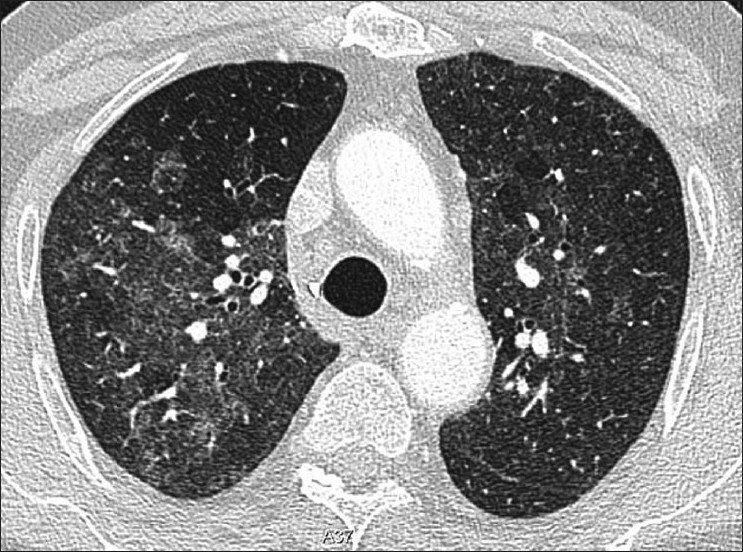 Intrathoracic lymphoproliferative disorders in the immunocompromised patient: CT findings. Radiology 1995;197:53-8. 59. Hsi ED, Foreman KE, Duggan J, Alkan S, Kauffman CA, Aronow HD, et al. Molecular and pathologic characterization of an AIDS-related body cavity-based lymphoma, including ultrastructural demonstration of human herpesvirus-8: A case report. Am J Surg Pathol 1998;22:493-9. 60. Oza UD, Munn S. Imaging HIV/AIDS. Body cavity-based lymphoma. AIDS Patient Care STDS 2003;17:129-32. 61. Morassut S, Vaccher E, Balestreri L, Gloghini A, Gaidano G, Volpe R, et al. HIV-associated human herpesvirus 8-positive primary lymphomatous effusions: Radiologic findings in six patients. Radiology 1997;205:459-63. 62. Frisch M, Biggar RJ, Engels EA, Goedert JJ; AIDS-Cancer Match Registry Study Group. Association of cancer with AIDS-related immunosuppression in adults. JAMA 2001;285:1736-45. 63. Aboulafia DM. The epidemiologic, pathologic, and clinical features of AIDS-associated pulmonary Kaposi's sarcoma. Chest 2000;117:1128-45. 64. Kirk O, Pedersen C, Cozzi-Lepri A, Antunes F, Miller V, Gatell JM, et al. Non-Hodgkin lymphoma in HIV-infected patients in the era of highly active antiretroviral therapy. Blood 2001;98:3406-12. 65. White DA. Pulmonary complications of HIV-associated malignancies. Clin Chest Med 1996;17:755-61. 66. Karp J, Profeta G, Marantz PR, Karpel JP. Lung cancer in patients with immunodeficiency syndrome. Chest 1993;103:410-3. 67. Aviram G, Fishman JE, Schwartz DS. Metachronous primary carcinomas of the lung in an HIV-infected patient. AIDS Patient Care STDS 2001;15:297-300. 68. Fishman JE, Schwartz DS, Sais GJ, Flores MR, Sridhar KS. Bronchogenic carcinoma in HIV-positive patients: Findings on chest radiographs and CT scans. AJR Am J Roentgenol 1995;164:57-61. 69. Allen JN, Wewers MD. HIV-associated bronchiolitis obliterans organizing pneumonia. Chest 1989;96:197-8. 70. Sanito NJ, Morley TF, Condoluci DV. 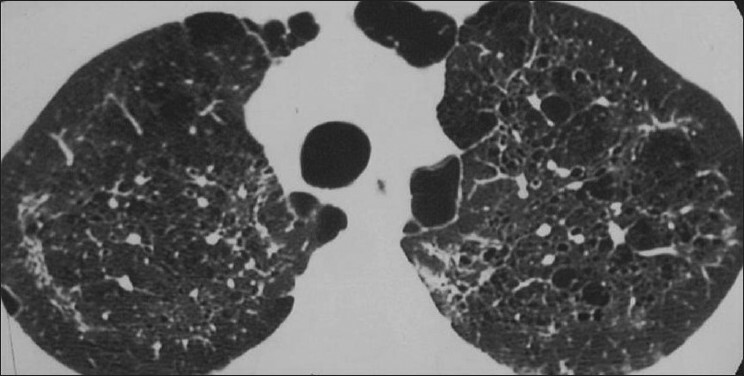 Bronchiolitis obliterans organizing pneumonia in an AIDS patient. Eur Respir J 1995;8:1021-4. 71. Dνaz F, Collazos J, Martinez E, Mayo J. Bronchiolitis obliterans in a patient with HIV infection. Respir Med 1997;91:171-3. 72. Khater FJ, Moorman JP, Myers JW, Youngberg G, Sarubbi FA. 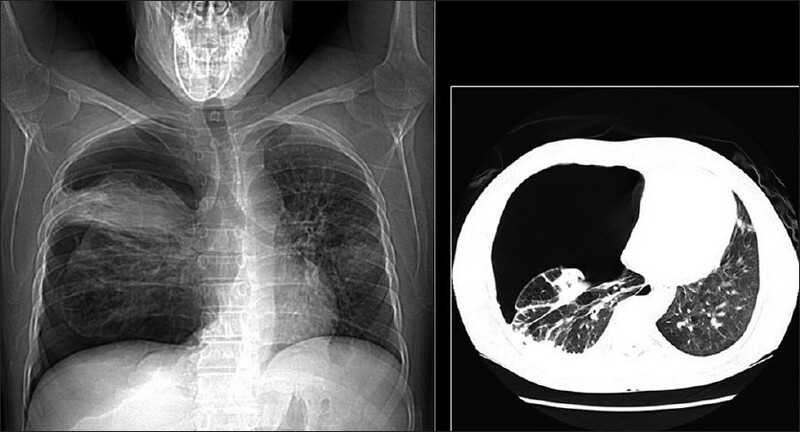 Bronchiolitis obliterans organizing pneumonia as a manifestation of AIDS: Case report and literature review. J Infect 2004;49:159-64. 73. Sara AG, Hamdan AJ, Hanaa B, Nawaz KA. 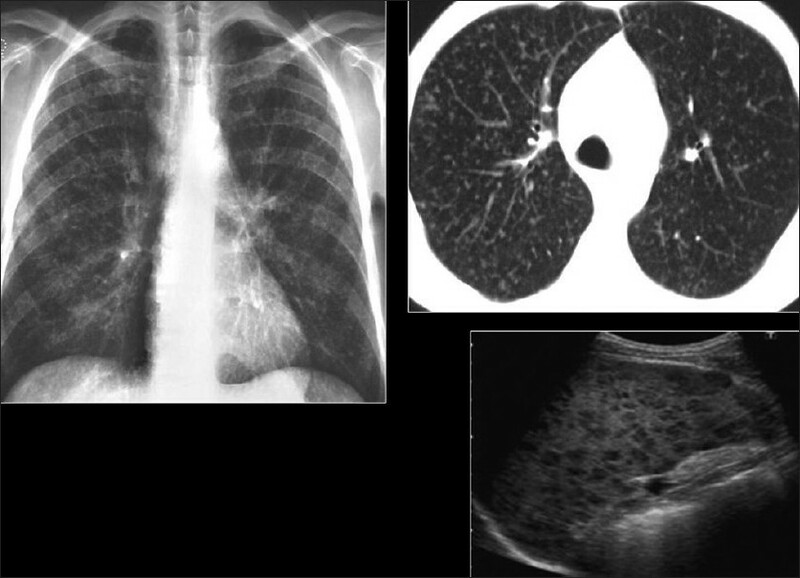 Bronchiolitis obliterans organizing pneumonia: Pathogenesis, clinical features, imaging and therapy review. Ann Thorac Med 2008;3:67-75. 74. Meng Q, Lima JA, Lai H, Vlahov D, Celentano DD, Strathdee SA, et al. Coronary artery calcification, atherogenic lipid changes, and increased erythrocyte volume in black injection drug users infected with human immunodeficiency virus-1 treated with protease inhibitors. Am Heart J 2002;144:642-8. 75. Copur AS, Smith PR, Gomez V, Bergman M, Homel P. HIV infection is a risk factor for venous thromboembolism. AIDS Patient Care STDS 2002;16:205-9. 76. Jasmer RM, Edinburgh KJ, Thompson A, Gotway MB, Creasman JM, Webb WR, et al. Clinical and radiographic predictors of the etiology of pulmonary nodules in HIV-infected patients. Chest 2000;117:1023-30. 77. Piyavisetpat N, Chaowanapanja P. Radiographic manifestations of pulmonary cryptococcosis. J Med Assoc Thai 2005;88:1674-9. 78. Awoyemi OB, Ige OM, Onadeko BO. 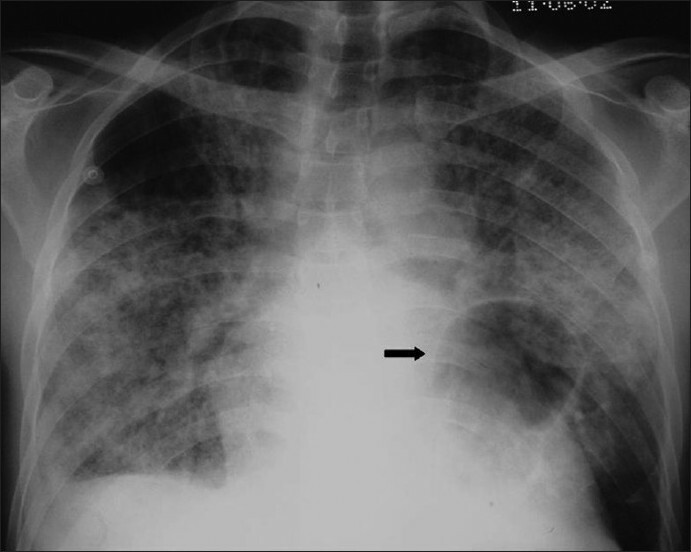 Pattern of active pulmonary tuberculosis in human immunodeficiency virus seropositive adult patients in University College Hospital, Ibadan, Nigeria. Afr J Med Med Sci 2002;31:25-31. 79. Batura-Gabryel H, Brajer B. Coccidioidomycosis in a 38-year-old man: A case report. Pol Arch Med Wewn 2008;118:387-90. 80. Murray JF. Pulmonary complications of HIV-1 infection among adults living in Sub-Saharan Africa. 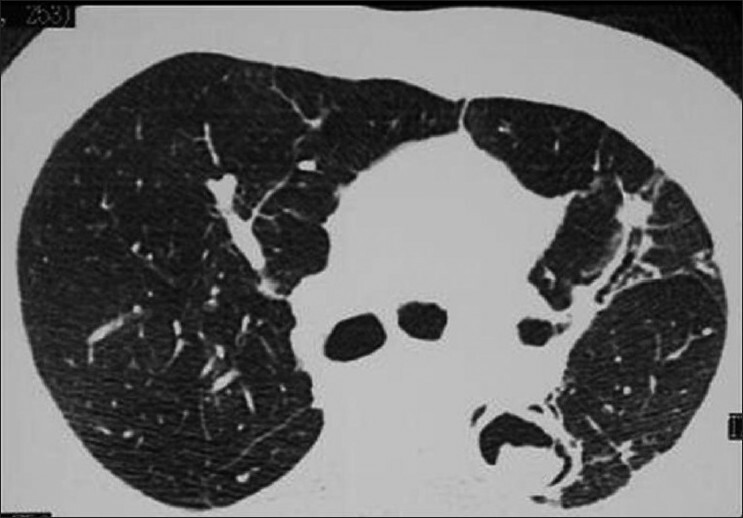 Int J Tuberc Lung Dis. 2005;9:826-35. 81. Gallant JE, Ko AH. 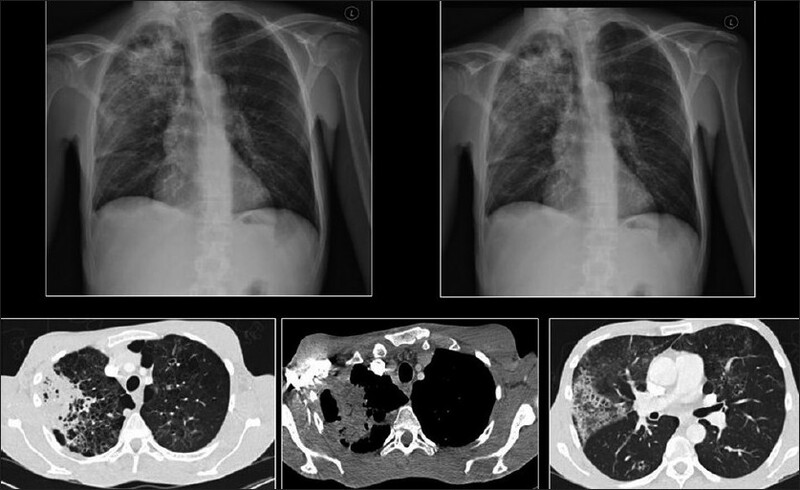 Cavitary pulmonary lesions in patients infected with human immunodeficiency virus. Clin Infect Dis 1996;22:671-82. 82. 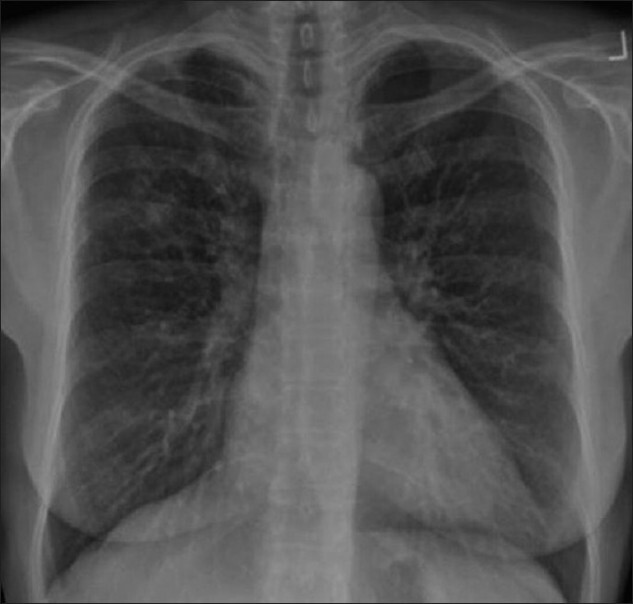 Jasmer RM, Gotway MB, Creasman JM, Webb WR, Edinburgh KJ, Huang L. Clinical and radiographic predictors of the etiology of computed tomography-diagnosed intrathoracic lymphadenopathy in HIV-infected patients. J Acquir Immune Defic Syndr 2002;31:291-8. 83. Schlossbauer T, Schmidt GP, Bogner JR, Sing A, Reiser MF, Becker-Gaab C. Pulmonary radiological characteristics in patients with HIV infection at the time of highly active antiretroviral therapy (HAART). Eur J Med Res 2007;12:341-6. 84. 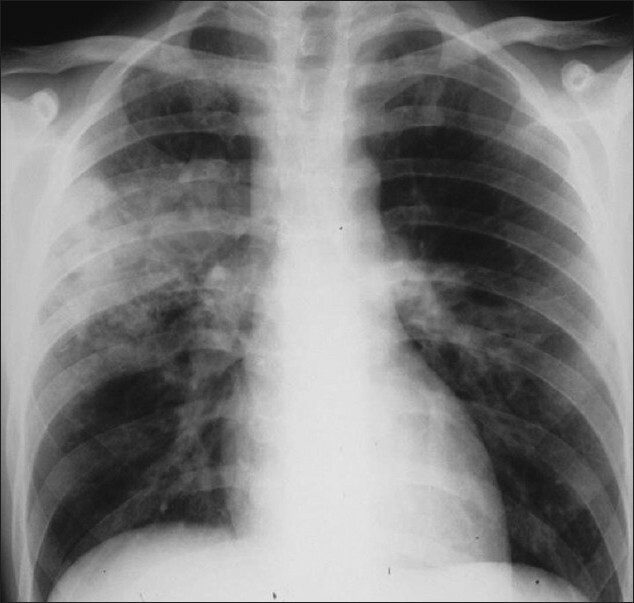 Shah RM, Gupta S, Angeid-Backman E, O'Donnell J. Pneumococcal pneumonia in patients requiring hospitalization: Effects of bacteremia and HIV seropositivity on radiographic appearance. AJR Am J Roentgenol 2000;175:1533-6. 85. Gasparetto TD, Marchiori E, Lourenco S, Zanetti G, Vianna AD, Santos AA, et al. Pulmonary involvement in Kaposi sarcoma: Correlation between imaging and pathology. Orphanet J Rare Dis 2009;4:18. 86. Godoy MC, Rouse H, Brown JA, Phillips P, Forrest DM, Mόller NL. Imaging features of pulmonary Kaposi sarcoma-associated immune reconstitution syndrome. AJR Am J Roentgenol 2007;189:956-65. 87. Ikebe T, Amemiya Y, Saburi M, Ando T, Kohno K, Ogata M, et al. Rare primary effusion lymphoma associated with HHV-8 in Japan. Intern Med 2010;49:1303-6. Feng, F., Shi, Y.-X., Xia, G.-L., (...), Lu, H.-Z., Zhang, Z.-Y. Authors of Document Fujii, T.
Lambert, A.A. and Merlo, C.A. and Kirk, G.D.
Stolagiewicz, N. and Tinwel, B. and Cormack, I.S. and Lucas, S.B. and Devaraj, A. and Kay-Loke, T. and Chua, F.
Lichtenberger III, J.P. and Sharma, A. and Zachary, K.C. and Krishnam, M.S. and Greene, R.E. and Shepard, J.-A.O. and Wu, C.C.